Welcome to www.ditto.it. A Techical Website ideal to Researchers, Graduate and Undergraduate Students.. This web site is not a journal as it is updated without any periodicity. It can not therefore be considered an editorial product under the Law n.62 of 07.03.2001. Wave Mechanics vs Quantum Mechanics.. 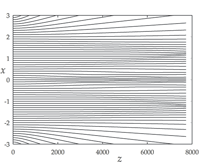 The behavior of classical and quantum wave beams in time independent media may be shown to be ruled by a wave potential function encoded in Contrary to a wide-spread commonplace, an exact, ray-based treatment holding for any kind of monochromatic wavelike features (such as diffraction and interference) is provided by the structure itself of the Helmholtz equation. This observation allows to dispel-in apparent violation of the uncertainty principle-another commonplace, forbidding an exact, trajectory-based approach to wave mechanics [Physics Essays, Vol.28, Issue 4, 2015. see more..]. 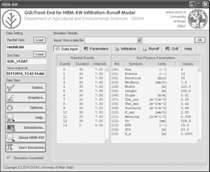 HIRM-KW (see screenshots) is an application which may be employed to simulate infiltration and runoff in bare soil (i.e. in absence of cover crop) subject to constant rainfall. It can also be coupled to an educational course in hydrology and in soil physics. HIRM-KW is a Windows application requiring the previous installation, at least, of the Microsoft .NET 4.0 FrameWork on your computer. [ view features & screenshot..]. Latest version, beta 1.0.1 (available soon). Latest version: currently not available (future). We present C-GAM (Crop Growth Analysis Model), (see screenshots) a user-friendly software tool for dealing the basic mathematical functions and statistics required for Crop Growth Analysis (CGA, adopting both classical and functional approach.